YOUR PICTURES JUMP OUT OF THE WINDOW INTO THE GARDEN. Create a unique universe with a pop-art picture, a landscape, a city or another category of our collection “Print pictures” and choose the option “treatment for outdoor exhibition” 100% made in France. The option proposed for each of our products is a manufacture treatment done by professionals. 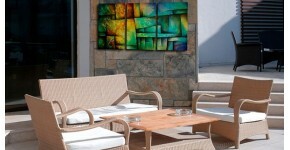 It will enable you to exhibit your pictures outside whether it is on your balcony, your patio or near your swimming pool. Your outdoor decoration will be enhanced and you will have a design garden! The picture will withstand high temperatures, direct UV’s but also frost, snow, rain and very low temperatures. The high quality Canadian pine wood frame is treated in an eco-solvent bath several times in 24h and the printed canvas undergoes a surface treatment for 12h. Because it is important to decorate the outside as well as the inside of your home, Artwall and Co have developed with the help of artists and professionals in the treatment of materials a new concept that will enable you to put your pictures wherever you want in your garden.